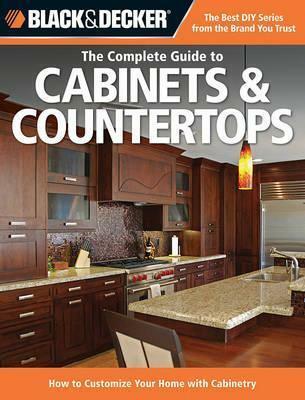 A skillbuilding and confidence-creating introduction to working with cabinets and countertops, TheComplete Guide to Cabinets & Countertops contains comprehensive information on the tools, materials, and techniques you'll need to create kitchen cabinets and countertops, bathroom cabinets and vanities, and even sturdy utility cabinets for the basement, garage, or home workshop. This book is packed with valuable information on selecting and ordering stock cabinets, including tips for assessing quality and suggestions for combining stock cabinets in innovative ways. It also has full, step-by-step instructions for building your own custom cabinets from sheetgoods and hardwood. Traditional joinery methods are shown, as well as how to use newer, knockdown hardware and modern fasteners. Techniques for making custom doors and drawers are shown in full detail, with helpful plan drawings and clear step-by-step photos. Finishing, customizing, and upgrading material is also included in the book. In the countertops section, you will find complete instructions for making and installing every popular countertop type, including post-form, custom laminate, ceramic tile, granite tile, poured concrete, and butcher block. You'll even find projects for working with solid-surfacing countertop material. Backsplash options are shown as well, along with instructions for drilling and cutting granite and marble materials and mounting all types of sinks and faucets.